I had to look bronzed-stroke-sunkissed for a casting this morning. Which would be a lot easier if my face wasn’t always five shades lighter than my body. I couldn’t fathom the idea of standing in my bikini looking as though I had been sunbathing with a paper bag over my head, and so a few days ago, I began tanning my face. As fake tan scares me, especially if it is destined for anywhere above my shoulders, I opted for one of the new (ish) breeds of moisturiser that has a ‘touch’ of self tan, or ‘sunless tanner’ if you want to use the jazzier term. 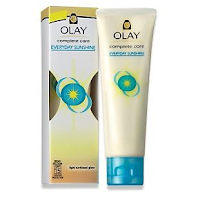 Olay Complete Care Everyday Sunshine promised a light sun-kissed glow, and a light sun-kissed glow it gave. I was rather impressed. It still had a very faint whiff of that chemical smell that seems to be obligatory with tanning products, but it was hardly noticeable. I haven’t needed to use my trusty tinted moisturiser in two days! I have that slightly caramel look that can never be achieved by normal people, on a normal holiday. Normal people spend the first week red and the second week peeling; this is the colour of a woman who will only sunbathe on the deck of a yacht, or a Californian teenager who frolics in the surf daily, wearing Abercrombie and Fitch cut-offs and a bikini top. Neither of these people are me, and so I am grateful for Olay’s ‘touch of sunless tanner’. The moisturiser seemed adequate, and it had an SPF of 15 (ironic, seeing as you are using it because you’re not seeing any sun action. I know, I know…cancer through the clouds…) but let’s be honest – it was the subtle, non-scary, non-streaking colour I was after, not the moisturising benefits! Previous Post The Ultimate lip-colour for Lipstick haters!